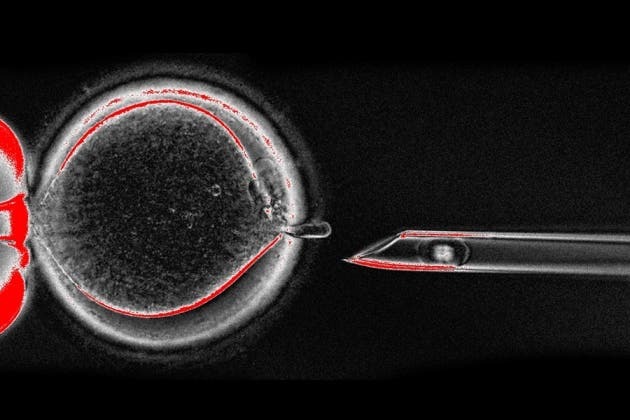 In 2014, we wrote that three-parent babies might become a reality in only two years. Well, a three-parent baby was recently born in Mexico, but that’s still in a legal gray area. Now, the UK is on track to legalize the practice as scientists say the technology is ready for clinical tests and we can’t afford to wait any longer. A pipette pulls out the nuclear genetic material from an unfertilized egg — a step in mitochondrial-replacement therapy. Image credits: Center for Embryonic Cell and Gene Therapy of Oregon Health & Science Univ. The United Kingdom might become the first country to explicitly allow babies with DNA from three people. Scientists advising the UK Human Fertilisation and Embryology Authority (HFEA) said that after 20 years of research and non-human tests, they’re finally ready to start working on the real deal. Basically, what this technique does is exchange a mother’s faulty mitochondria for healthy ones from another woman’s egg. So in the end, the baby won’t just have the DNA from the parents – the DNA from the egg donor will also be included. Mitochondria are found in every cell of the human body except red blood cells, and convert the energy of food molecules into the ATP that powers most cell functions. When a large percentage of these organelles malfunction, cells can’t do their jobs properly causing various illness, from weakness to death. This is a major problem for many people, preventing them from giving birth to healthy children. “We’ll be ready, I hope, to press the button if we get the green light,” says Mary Herbert, a reproductive biologist who is part of a team at Newcastle University, UK, seeking to offer the treatment to women. Indeed, there are valid concerns with this technique. Particularly, it’s not always effective, as recent research has shown. Basically, it might not prevent mitochondrial disease. According to Nature, a recently published study led by mitochondrial geneticist Shoukhrat Mitalipov, at Oregon Health & Science University in Portland, further supports that concern. His study suggests that picking donors that have similar mitochondrial DNA is important and reduces the chance of complications. But Herbert believes that not only is this not the case, but it would make the donor-finding process much more cumbersome, making the whole process more difficult. “You’re setting up an arms race between the two mitochondrial genotypes and keeping your fingers crossed. I think a better use of time and money would be to redouble our efforts to get the carry-over as close to zero as we possibly can,” she says, addressing this idea. So we’re still taking things well into the realm of the unknown, and the most important thing is to reduce health hazards as much as possible, which is why the decision to regulate this technology is so important. “It’s not perfect. There’s this chance of something going wrong,” says Robin Lovell-Badge, a developmental biologist at the Francis Crick Institute in London who was part of the HFEA panel. People considering the treatments, he adds, “must understand it’s impossible to ensure total safety until clinical trials have taken place”. However, we also can’t afford to wait, as Mitalipov himself stresses. Either way, UK’s decision is expected to be decisive.